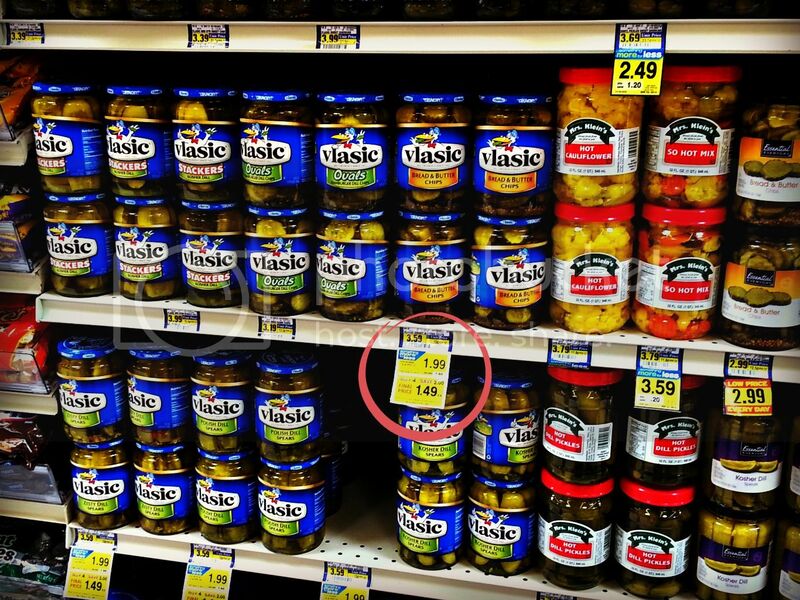 Blissful and Domestic - Creating a Beautiful Life on Less: Monthly Grocery Shopping: Albertsons - Save on pickles, Juice, cereal, and more! 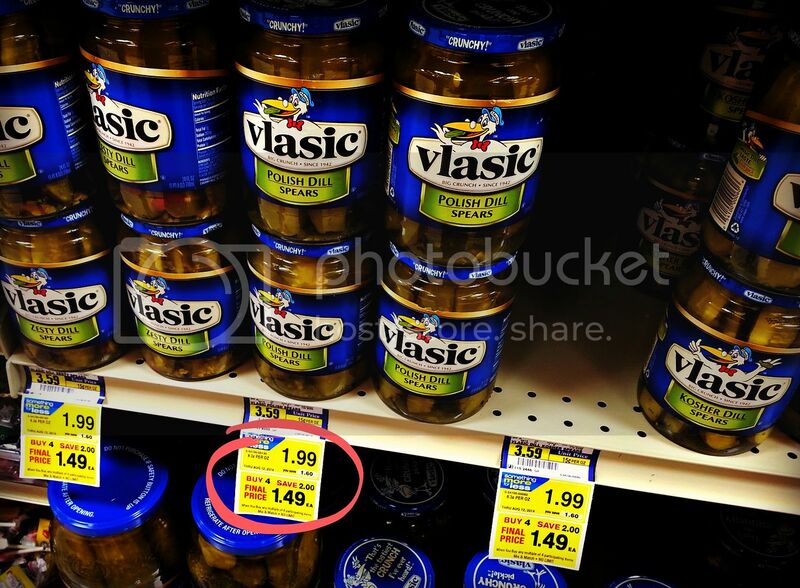 Monthly Grocery Shopping: Albertsons - Save on pickles, Juice, cereal, and more! If you do not agree with my purchases, that is fine by me, but please be kind in the comments. I am simply sharing what works for my family. Morning lovelies! This past weekend I was able to get the rest of my monthly shopping done. I plan on sharing it over a few posts. I ended up going to a few stores, to score some of the sales that were happening in my area. 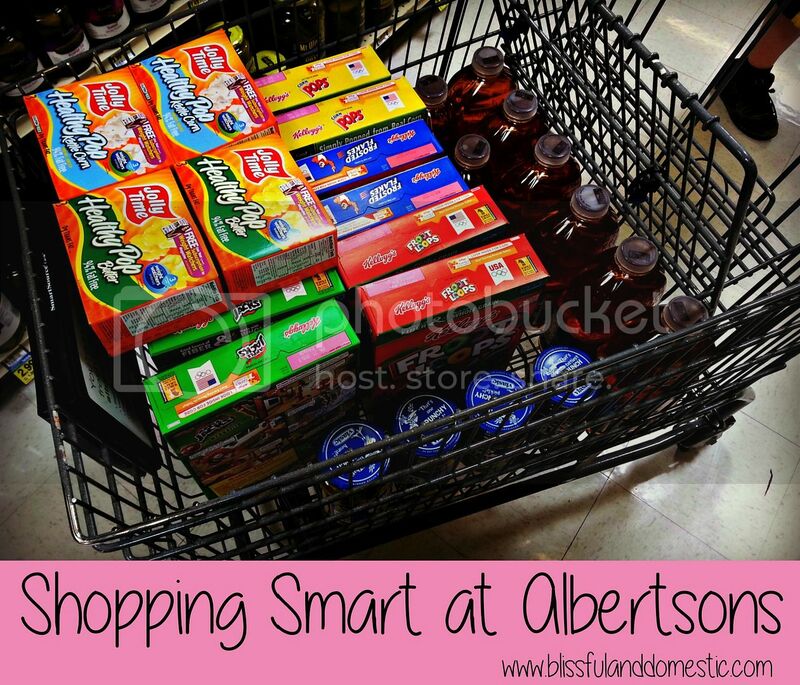 Today I am talking about Albertsons. I will share what I bought, how we make it work for us, and how we save money grocery shopping each month. Before shopping, I spent the morning going through adds and writing down everything I wanted to buy. As I looked through the sales, I would ask the kids to go and check out our food storage, so I would know if it was something we needed to buy this month or not. Our food storage consist of our pantry, shelves in both of the kids rooms, and a shelving unit next to our washer. Over time we have been able to build up a stockpile or food storage, as us Mormons like to call it :) We keep these shelves stocked, constantly rotating the food and replacing it when used. If your kids are old enough, get them involved. Be creative. 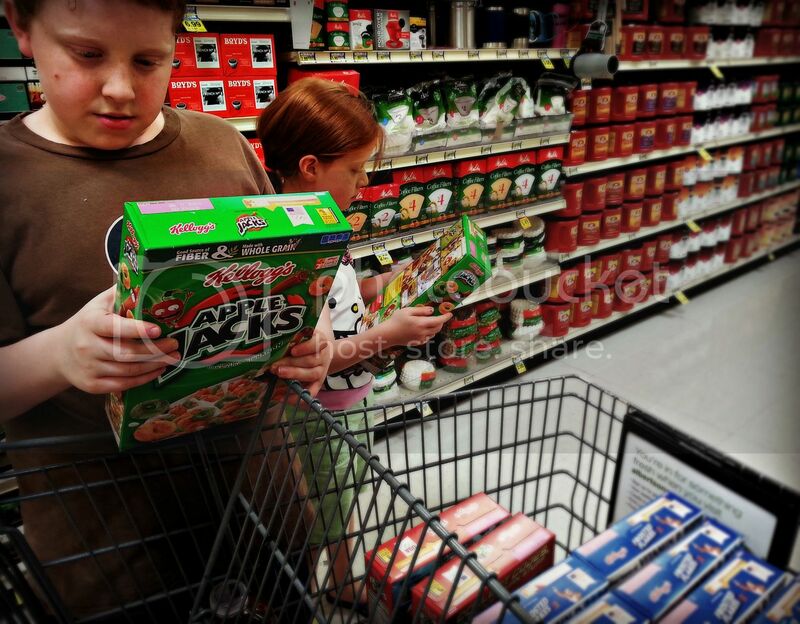 There are ways for munchkins to be involved with shopping at all ages. Now that mine are getting a little bit older, I take them with me. On Facebook we started a convo on this very same topic. Check it out to see what other Moms are doing to shop on a budget, while having munhckins tagging along. I mentioned in my last grocery shopping post, that this month I didn't need to stock up on a lot of meats and frozen foods. As I do these grocery shopping posts, you will see a pattern. 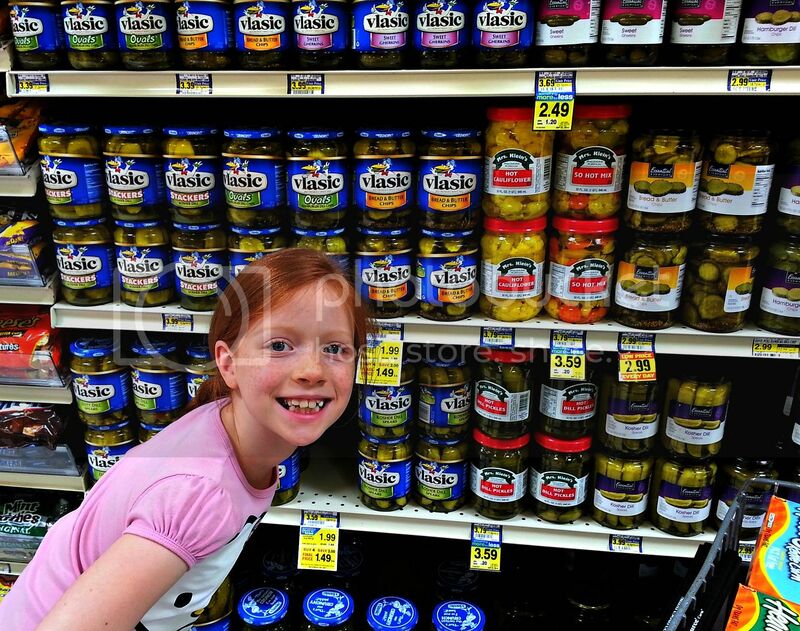 Some months I stock up on canned goods, while others I stock up on snacks or meats. Shopping this way allows us to constantly rotate our food storage (so nothing goes bad) and shop the sales as well. I try to only buy when things are at rock bottom prices. This helps me keep my family fed and stay within my budget. This month I was on the look out for cereal sales. We were running low (meaning I only had about 6 boxes left). My kids and husband can go through at least 6 boxes in a month. Hubby eats cereal for a snack. He is obsessed, so I was on the hunt for a good deal. I try to keep about 30 boxes of cereal in our food stockpile. I know that seems like a lot, but if I find them on sale and stock up, then I won't have to buy cereal every month. I typically buy cereal every other month. This keeps our stock at about 30 boxes. We have had times where there was little money to shop with. Keeping our food storage stocked when we did have money, has helped us in those lean times when we had little (AKA preparing for a rainy day). It is our saving grace! I don't like to pay over $2 for a box of cereal either. Because of that, I only buy it on sale or I buy the generic kind from Winco. Typically I like to keep us stocked up on Rice Krispies, Corn Flakes, Cheerios, Honey Bunches of Oats, and Shredded Wheat. These are my favorite and in my opinion, a healthier option compared to all the other cereals out there. Hubby has another opinion. He prefers the sugary cereals. Our compromise is that I will only buy them if they are on sale for $1.99 or less. Ideally I like to get them for $1.49. That price really makes me smile...and I am not gonna lie. I like to have a little cereal snack too! Haha! Just keeping it real ladies! I think it is important to compromise when you shop. You can have all the best intentions in the world, but if your family is wanting that special something every now and then, it doesn't hurt to indulge...for the right price that is. Then everyone gets a little bit of what they want and it is easier to keep everyone on board with healthy eating and healthy spending. 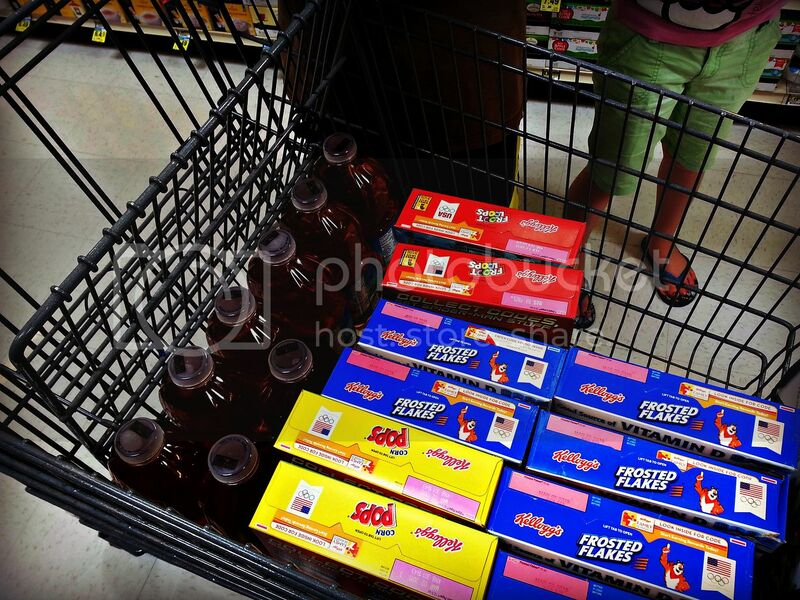 I buy the sugary cereals when they are on sale, so no crazy shopping is going on when Hubby's craving hits. When he starts craving his favorite cereal snack, he goes to our food storage and is able to pick it out. He use to have that craving and then run to the store, which would blow our budget. I started thinking ahead of his cravings and now everyone is happy. He gets to have his treat and I get to keep us within budget. I also stocked up on microwave popcorn, pickles, apple juice, margarine (don't judge me. haha! ), Eggo Waffles (our special treat for those kids and me), Chimichangas for the hubbs, and crackers. Waffles and for two boxes of cereal. Popcorn- Popcorn is such a great snack. Whether you use an air popper or a microwave, it is a great snack that fills tummies. It also makes a great snack for movie night:) These six boxes will last us about two months. I put one box into the pantry and the other ones go into my son's room. His room is where we store snacks (at the top of his closet). This puts the snacks out of reach from little hands. Out of sight, out of mind is how I am able to stretch our snacks. Cereal- Now I know I talked a lot about this one above. We love cereal in this house and I am all about compromise. I buy my favorites and Hubby's as well, when they're on sale. 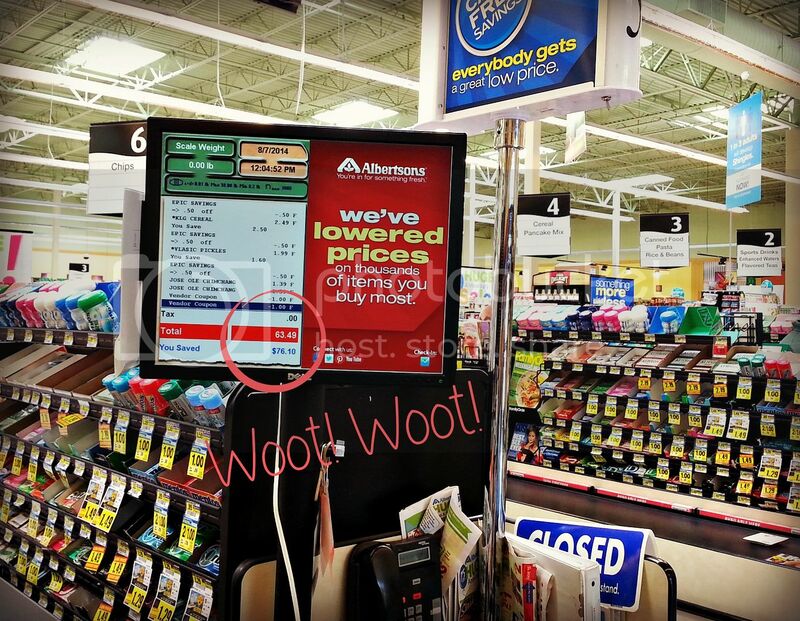 It helps everyone keep a smiley face:) Combine coupons for more savings!! Eggo Waffles- ok these things are my nemesis. I have a love hate relationship with them. I love the taste, but I could eat like 5! They have a nostalgia for me. My Mom and Dad always bought these, so they instantly taste like home. Nerdy I know! These are my guilty pleasure buy this month:) Yum! Yum! Cheddar Club Crackers- These were half off at the grocery store today. I bought two packages. One went into the pantry and the other went into food storage. I won't take out the other package till next month. The out of sight, out of mind thing really helps me stretch our snacks. No matter your income, there are ways to eat your favorites, whatever they are, and save money. Look for sales. Write down a list, go through with a calculator, and stick to that budget. This is crucial! If you have a husband that is a junk food junkie (like mind), come up with a compromise. This will help you both get what you want. They get a few of their treats and you get to have a budget that has not been blown. Win! Win! Amen, sister! My hubby loves chips, but thank God he is also a fruit and nut junkie. He especially loves those trail mixes (the spicy ones), but they are always so expensive. Any tips? Recipes? I don't mind spending most of my money on fresh ingredients, but if I see a good sale on cereal or chips, I like to stock up, too. There's nothing like a ham and cheese sandwich with a bit of chips on the side. I tend to shop like you. You can always tell someone who stockpiles/has a food storage by their cart. This morning I had 20 boxes of Kleenex ($0.99 each) and canned fruit ($0.79 a can). Great job! You go girl. I really need to start doing this. I keep telling myself I will and then grocery day comes and I just get what I need. Thanks for reminding me of what I NEED to do!! My butter tip (since you asked). ;) We feed our family of 6 on $400 a month, and we only buy "real" butter. We do stockpile + freeze when it goes on sale in the winter and baking goods are cheaper. However, my personal opinion for our family is, I would rather use a small amount of the good stuff (real butter, good parmesan cheese, good ice cream etc.) than a larger amount of the cheaper stuff. It saves us money because we get the real taste + cravings satisfied on a smaller amount of product, if that makes sense. We buy our butter at costco in the four packs for about 8 bucks or 2 dollars a pound. I love saving money too! My goal is always to be at 50% which is very hard to do in San Diego. I love reading how people save and what their methods are, good job!!! Stopping by from Sincerely, Paula's Blog Party, nice to meet you! We're like W. We buy butter and use it sparingly. Just a dab is very satisfying, as it's made from natural, rich ingredients. We buy it at Costco, and it lasts a while, mostly used to top bread or veggies and for occasional baking. I used to lather on the margarine much more, thinking it was lower in calories and needing the extra layer to get a satisfying flavor. Do you like popcorn on the stovetop? I don't like microwave popcorn or air-popped myself, but the stovetop popped is cheaper and still tastes good (IMO). However, my kids really like microwave popcorn, so I sometimes buy it also. I am not criticizing the purchase, by the way! :) Your family looks pretty healthy and happy to me, and I buy it for my own kids. I just can't understand why my kids like it. :) I buy butter at Sam's, but we don't go through it that quickly. It is about $2/pound there. I use butter and margarine. I want margarine in my oatmeal and on toast. But, since butter is better for me, I use it where I can. My butter secret is just the stock up and use coupons. One of the grocery stores in our area had butter on a sale which made it $2/ pound and I had a $1/ off coupon. I bought like 5 and froze them. We seem to go through times where we don't use butter. Sometimes I stretch it by using olive oil in place of it. Or I will do half butter and half fruit puree. Usually works. Like you, I try to stock up on what's on sale and don't often pay full price for things. I was raised on margarine, too, but have come to feel it isn't food. I haven't had it in the house for at least twenty years. I almost always buy house brands on sale. It has shot up again, but I noticed that at Walmart, it is a lot cheaper if you buy a two pack for just over five dollars. That brings it pretty close to Sam's price, where I also buy it. When I make garlic toast to go with spaghetti, etc, I spread the slices of bread first with a thin layer of butter, then spray with a mist of olive oil. Less butter, and the olive oil is good for you. I got the idea from a restaurant dipping sauce for bread that seemed to be a combination of clarified butter and olive oil. My MIL taught me to always leave a stick of butter in a covered butter dish on the counter. It NEVER spoils, and being soft, you use much less when you want to spread it over something. thank you for sharing your saving tips. I appreciate them.. I love reading how others save , and it gives me ideas. I too, only buy when items are on sale, and keeping my stock built up allows this..
On the butter issue, I too buy margarine I was raised on it too.ha. I buy it , because it is so much cheaper. I do buy real butter, when I find it on sale. I freeze it and use for baking cookies ,etc.. But everyday eating...we use margarine, I buy Blue Bonnet when it goes on sale, and buy enough to last until the next sale..